What could be better than eating a cake you made yourself! Invite your friends over for a fun afternoon and show them what a good baker you are. 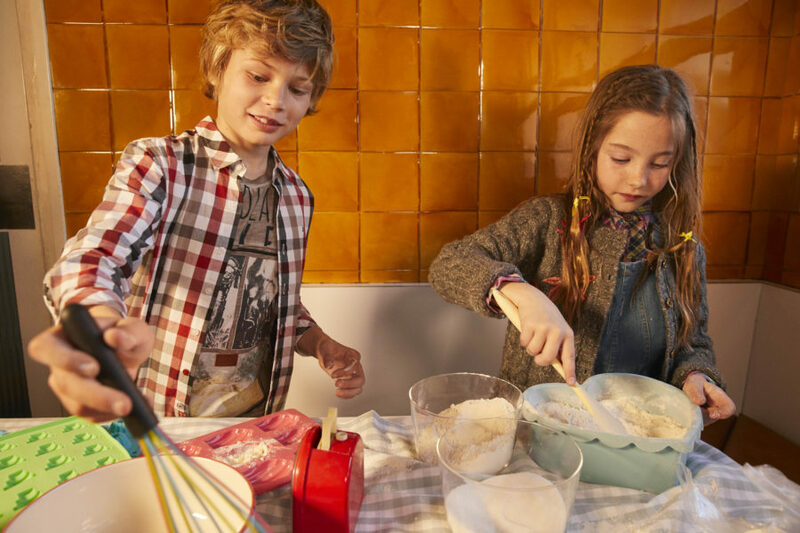 Have the cake pan and all the ingredients on hand… and get ready to create! 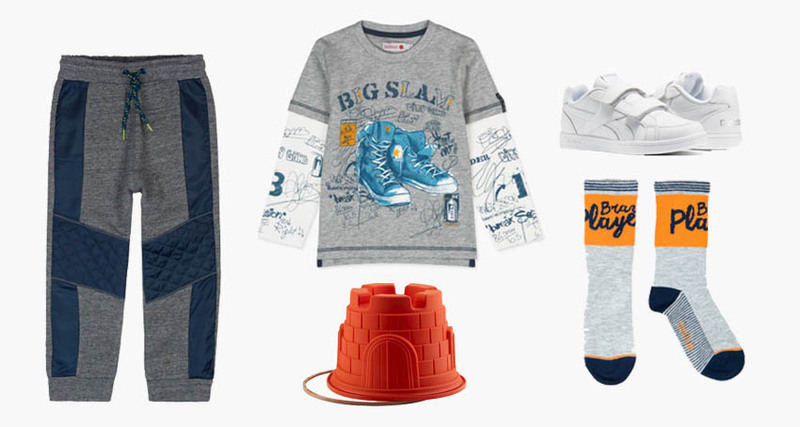 Child’s light gray T-shirt with white sleeve details and print decoration, gray drawstring trousers with blue panels, striped socks in different colors, white velcro shoes and cake pan in the shape of a castle. This colorful autumn look is rainproof and perfect for gray days. Have your dad help put together a sandwich tasting party in the garden for all your friends. After your snack, try to jump in all the puddles you can find. With boboli rainboots… you’ll be sure to have an advantage! 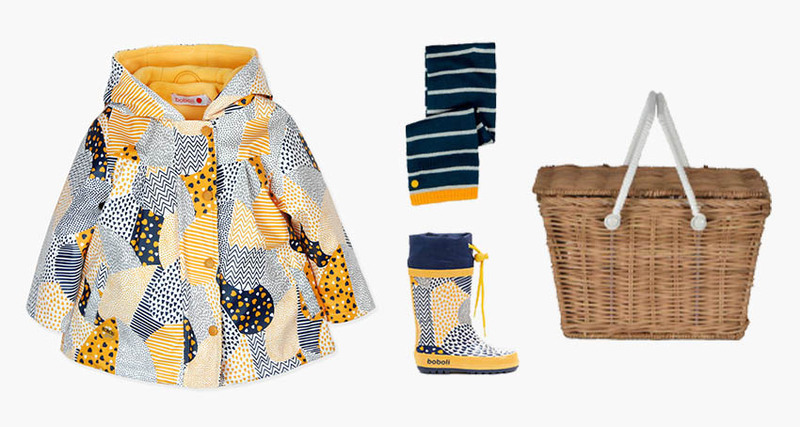 Hooded rain coat in a multi-color print and lined with mustard yellow fleece, rain boots in a multi-color print with adjustable laces, striped scarf in indigo and white with mustard yellow details, and picnic basket. If the cold has come early this year, board games in front of the fireplace can be the focus of snack time. We have an ideal outfit for the occasion: it’s comfortable, warm and matches your cup of hot chocolate. 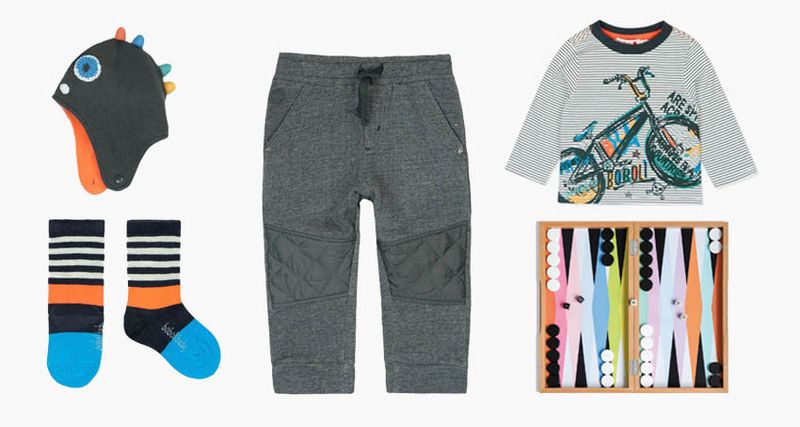 Top with white and dark gray stripes and multi-colored print decoration, dark gray adjustable drawstring trousers, gray hat with multi-colored details, striped socks and wooden backgammon set. Snack time with a movie can be the best! This outfit is perfect for welcoming your guests, making them comfortable on the sofa and showing them your favorite movie. After watching, you can all rate the movie and be the festival jury. The next movie will be at a friend’s house and whichever gets the highest score will win the festival. Remember to tell your friends that it’s a very important festival. They have to look their best! White top with embroidery detail, black tulle skirt with an adjustable waist, black tights with rhinestone details, matching gold ballet flats and salted popcorn.